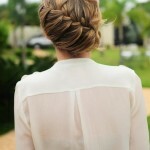 Home » Popular Hairstyles » Back View of Messy Braided Updo – So Cute!!! Back View of Messy Braided Updo – So Cute!!! As a perfect example of the very latest trends in international hair design, this style is unique and exciting! From one side, the hair is swept into a fabulous horizontal braid, which creates a beautiful pattern in the sections brought up from underneath. The crown is kept casual and messy above the lovely braiding. From the other profile, the hair is lightly back-combed to give it body and trendy asymmetrical volume contrasting with the braided profile. Then the loose hair is expertly twisted and pinned onto the head in a breath-taking display of swirling loops. The clever highlighting in the hair mixes warm browns with dark golden blonde, which highlight the contrasting textures and shapes perfectly! And to finish off this fantastic up-to-the-minute hair design, lots of wispy tresses are left free to accentuate this absolutely suberb, casual contemporary look!